​What do I do if my dog gets sprayed by a skunk, how can I remove the smell? Clean the affected areas with this solution. Avoid using the solution in pets’ eyes. Rinse with water and repeat if necessary. I heard that antifreeze is harmful to animals. Is that true? Is there an alternative? Most antifreeze is made from ethylene glycol. Ethylene glycol-based antifreeze tastes sweet but is highly toxic to both humans and animals. To help protect pets, wildlife and children, the provincial government passed a regulation that requires the addition of a bittering agent to all antifreeze sold at the consumer level in British Columbia. The regulation, the first of its kind in Canada, took effect in 2011. It is hoped that the addition of a bittering agent will make antifreeze less appealing. While this is a step in the right direction that will undoubtedly save lives, consumers should still be encouraged use antifreeze made from propylene glycol instead. Propylene glycol-based antifreeze is slightly more expensive, but is non-toxic to pets and wildlife. All cars, trucks, buses and farm tractors use antifreeze to help prevent their engines from freezing over in the winter and overheating in the summer. Antifreeze is the yellow-green liquid that is poured into radiators and circulates through engines to keep them operating at safe temperatures. Conventional antifreeze contains ethylene glycol, which is very poisonous to people and animals. Many animals like the sweet taste of antifreeze and will readily consume it when given the opportunity. However, antifreeze, even in the smallest amounts, can have a very harmful and often fatal effect on your pet. A single teaspoon will kill a cat and a tablespoonful will kill a 10-pound dog. Thousands of animals (pets and wildlife) die each year from antifreeze poisoning. Antifreeze leaks from automobiles and is spilled in garages and onto pavement due to careless fluid changes. In other instances antifreeze has been used to deliberately poison animals as an act of cruelty. If you suspect your animal has ingested antifreeze, seek veterinary aid immediately. YOUR PET WILL NOT RECOVER ON HIS OR HER OWN. Time is critical as within minutes your pet will begin to experience kidney damage. Read more about what to do if you think your pet has ingested antifreeze. Fortunately, there is a less toxic alternative to the ethylene glycol-based antifreeze that is most commonly used. Pet-friendly antifreeze is propylene glycol-based and is now available at some retail outlets or through your local automotive centre. If your mechanic isn’t using pet-safe antifreeze ask them to special order it for you. It may cost a few dollars more but it could save animals’ lives. You can download our campaign poster and provide it to others to explain why they should make the switch. Animal-friendly antifreeze has anti-corrosive properties, is biodegradable and is recyclable, making propylene-based antifreeze a better choice for the safety of pets and wildlife, personal health, vehicle engine protection and the environment. Make the switch today! Pet- and wildlife-friendly antifreeze is available in Lordco locations throughout the province. Uni-Select Automotive also offers these products nationwide and supplies them to more than 2,000 automotive centres. Customers can request propylene glycol antifreeze from their automotive service centre or purchase it separately and ask that their auto centre install the product. Mop up spills and dispose of antifreeze properly. Take used ethylene glycol or propylene glycol antifreeze to an auto centre that recycles antifreeze. Never pour any used antifreeze (ethylene glycol or propylene glycol) down storm drains, sinks, toilets or on the ground. British Columbia has a network of approximately 500 return collection facilities that accept used antifreeze (common ethylene glycol and propylene glycol), oil, oil filters and oil and antifreeze containers at no charge. Visit the B.C. Used Oil Management Association website to find a location near you or contact the Recycling Council of B.C. at 1-800-667-4321 for a list of outlets. 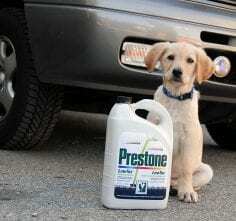 What do I do if my pet consumes antifreeze? Animals who have ingested antifreeze go through two stages of symptoms. If untreated, death from kidney failure will occur within days. Learn what to do if your pet has consumed antifreeze. Find out more about cold weather pet safety and how to keep your furry family members safe during cold weather. 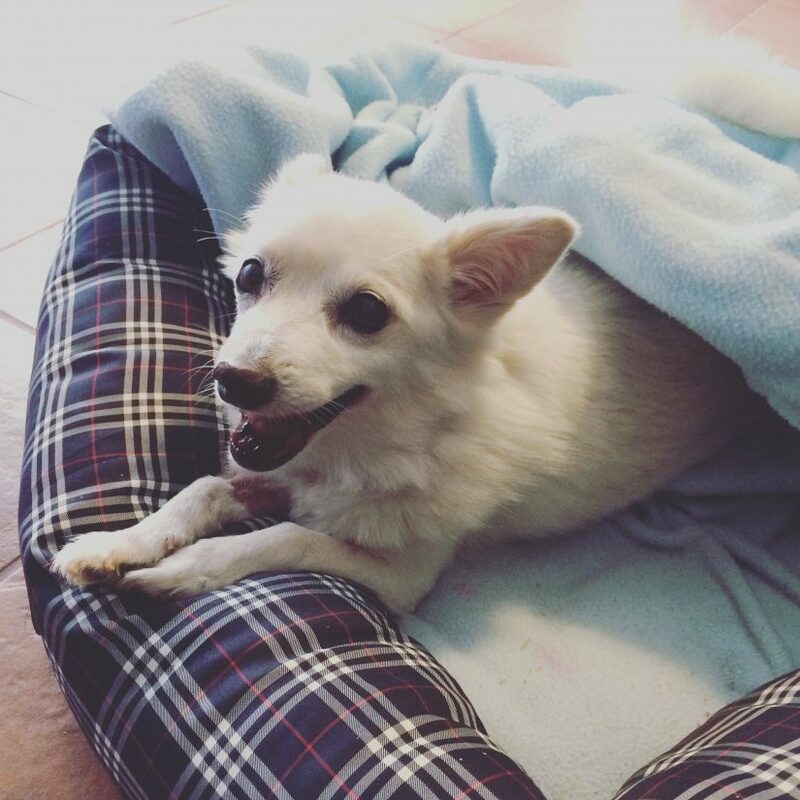 How do I welcome a new dog into my home? Bringing a new dog into your home is an exciting time. For a dog going into a new home, it will be stressful. You know where everything is and you’ve been through your home lots of times. For a new dog this will be the first time he’s seen your living room, your kitchen, or even seen your cat. Remember everything is a first for him in your home. Think of it being like when you moved into a new home or got lost in a new town. Have patience, understanding and be forgiving if your new dog doesn’t know something. To make it easier on your new dog and to help him get use to your home, it’s best to plan for his arrival and his first few days. Think of what you will need, what he will need and make a plan. Food: Make sure you have some of his previous food so you can mix it with his new food if it is different. Switching to a new food without a slow transition can cause diarrhea. Food & water bowls: Have the right size bowls for your dog. Check with your veterinarian to see if your dog’s bowls should be elevated off the ground. Collar & harness: Put a collar on your dog even if you only walk him on a harness. Collars will have his I.D. tag and license on. Do not use a choke, prong or any collar that causes pain, stress or injury. Dog toys: Toys are an important part of helping your dog engage in normal dog behaviour. Get toys that are appropriate type, size and safe for your dog. Dog puzzle feeding toys: Also known as smart or work to eat toys, they’re a fun way for your dog to work to get his food. These feeding puzzles engage your dog in doing natural scavenging behaviour. Some dogs will need to be shown how to use them at first. Kong: Kongs that are the right size for your dog are great smart feeding toys. You can fill them with food and freeze them for your dog. Bed: Get one or two comfortable beds and have them ready for when he comes home. Don’t forget his bed from the shelter, other home or rescue. It might be used however its familiar and will help when he moves in to lower stress. Crate: Make sure the crate you get is the right size for your dog. A puppy will need a smaller one and as he grows, he’ll need more space. Your dog must be able to stand up, turn around and lay so he can stretch out comfortably in his crate. Pee pads/puppy pads: If you have a puppy be prepared. Where will you put the pee/puppy pads, how will your pup know where they are? Exercise pen: It’s always a good idea to use an exercise pen for puppies or new smaller dogs. These are idea when you can’t supervise and you’re working housetraining and chewing issues. Go to the washroom – if it’s a puppy where will the puppy pads be, where will he go when outside? Walk – where will you walk him, can he go to the dog park, what if he doesn’t like other dogs? Housetrain an adult dog or puppy – what’s your schedule? Puppies need out more often. Reward him – for going to the washroom outside, where will you keep treats so they’re handy. Train him – yourself or hire a qualified humane trainer. Crate train – not all dogs are crate trained, you’ll need to train him & crate train puppies. Introduce to cat – has he met cats before, how do you introduce and keep your at safe? His things from shelter, other home, rescue – take as many of his things as you can. His bed and toys will help when he has them in his new home. Veterinarian – when will he go for first visit, which veterinarian will you use? Daycare – should your new dog go to daycare, which one? Behaviour problems – What will you do if there are some you didn’t expect? Elevator – has he been in an elevator before? How can you help him if he’s scared? It’s important to try and think of everything you might need for your new dog. Getting your home set up so when your dog does come home you can focus on him and helping him move in. Note – don’t bring your new dog or puppy home and just leave him alone while you go out. What should I expect to do after day one with my new dog? Veterinarian visit – take your dog to the vet for a checkup and a microchip if he doesn’t have one. Learn about basic dog care. I.D. your pet and get your dog license – visit your local animal control and get a license. It’s the law and it will help get your dog back to you if he ever gets lost. Contact the shelter, previous owner or rescue with questions. How do I welcome a new cat into my home? 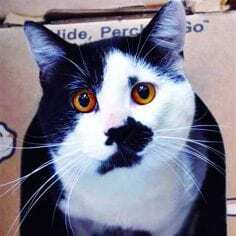 Cats are wonderful companions and giving a cat a home is a wonderful event, but it is important to remember that cats can be very timid and afraid when transitioning into a new home. When you arrive home, go straight to a small room where your cat can stay for a few days. There should be no places to hide in this room except for a crate or their carrier box. The room should have a litter box, food and water bowls. Cats do not like to eat near their litter box so keep the food bowls and the litter box away from each other. 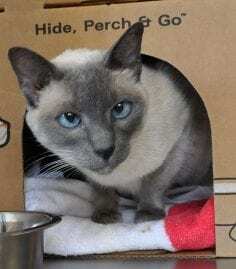 Open the crate or setup the Hide, Perch & Go™ box you got from the BC SPCA shelter and let your cat out. Let her explore the room. Place the crate near a wall. Sit on the floor and quietly observe. Your cat may come to you right away or go in her crate. Do not hold, restrain or force her to do anything. Leave your cat in the room. You’re excited, though being patient for a few days is the best and most loving thing you can do. Remember a new cat coming from a home or shelter may have just experienced a difficult time in their life. They have lost their home and routine. Give your cat the time and space she needs to get used to you and her new surroundings. Go to the room as often as you can. Bring gifts such as healthy and tasty food treats or toys (e.g. feather stick, cat ball) every visit. Every person in the household should take a turn doing this. Sit on the floor and place these treats near you or wave the toy around. Wait for your cat to come to you – DO NOT grab or attempt to hold the cat. Talk to her – a high-pitched but quiet voice is always more reassuring for cats. If she comes to you, pet her gently under the chin. Every cat is different. Some may show you love and climb on your lap right away. Others may stay in hiding and watch you from afar until they feel safe. Take your cues from your cat. Let her make the decision of how much interaction she’s comfortable with her. The adjustment may take hours, days or even weeks. For more tips download our our care sheet (PDF). 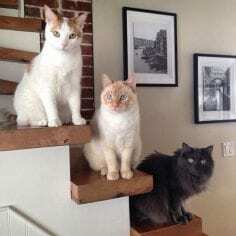 ​How do I introduce my new cat to my old cat? Thinking of getting a second cat? Below are some tips for introducing your new cat to your resident cat (PDF). When bringing a new cat home to meet your resident cat, it’s never a good idea to just throw them into a room together. That can be scary for both of them! Go slow and introduce them. For both animals this can be a stressful time. A gradual introduction process is important for them to build a friendship. If one cat gets hissed at or swatted, she may always be afraid of the other cat. Set aside one room for your new cat away from the resident cat’s favourite place. Have at least one comfortable sleeping area, one hiding area such as her carrier box, crate or a “tent bed”, a litter box, a water bowl and a food bowl. Plug-in a Feliway® diffuser. You can get one at your veterinarian office. It reproduces cat facial pheromones that are pacifying to cats. It will help lower their stress. It’s a good idea to have a diffuser in the new cat room and somewhere in the house where the resident cat spends time. Cats feel safe when surrounded by their own scent. Place towel or bedding she has been sleeping on in the carrier box so that she has familiar scent during the trip. Once home, take your cat to her room right away. Do not come into contact with the resident cat. Keep her inside the carrier box until you are in her room with the door shut. Place her box or other hiding area in a corner of the room (away from the litter box) and place the carrier box beside it. Open the door. Do not force her to come out. She may be scared and stressed by the new environment. Leave her alone in the room. Allow her to settle down and come out on her own. Cats communicate visually but also by scent. So you must start by introducing the cats to each other by “swapping “scent. If your cat starts to hiss, spit or avoid the towel place it on the floor away from his bed or food bowl. Each day move the towel closer to the cat’s food bowl. Do the same thing with your resident cat’s bedding giving it to the new cat for her to smell. Swap food bowls between the cats. They will start to associate the positive act of eating with the scent of the other cat. If one of the cats is sick or on a special diet, ask your vet before trying this. Once they are completely tolerant of each others scent proceed to visual contact. How long will it take for cats to like each others scent? This can vary from a few hours (usually when one is a kitten or both are social cats) to a few months. Set aside special play and petting time each day. You want to have one on one time with each cat when your introduction is taking longer. Separate physically with screen door or baby gate. If not possible then open new cat’s door slightly so cats can see each other but cannot fit through door. Give cats treats so they spend time close to each other or play with a feather to encourage play. Do not use catnip. When comfortable with each other they will sniff noses, play through the door or rub against the door. When you see this, you can have a proper introduction. There should be no growling, or repeated spitting or hissing. 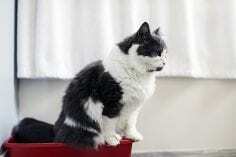 What if my cats are showing aggression towards each other? Is the aggression more severe than a hiss or a quick swat? Make the opening smaller and over the next few days, feed the cats closer and closer to the door. Open the door and let them explore. If they fight, interrupt them by clapping your hands or with another noise that doesn’t scare them. Don’t pick them up or force them to interact. Let them distance themselves from each other if that’s what they want. Do they each need their own litter box? Give each cat his or her own litter box and add an extra one. They should have their own bowls, beds and hiding places unless they choose to share. Introductions, when done properly, can take more time than expected. Introductions and building a relationship for some cats may take a few hours or up to a few months. Your cats may play and groom each other or just sit and watch each other. Don’t force them to be what you think best buddies act like. Watch for bullying, sometimes one cat will not let the other one through a door, or have access to the food bowl. You may see them swatting or hissing when the other cat tries to go to the food bowl. Watch for signs one cat is avoiding areas. If you think she’s being bullied make sure she has her own space and things like bed, litter box, food bowl. Never punish either cat if they show aggression. If you see, signs of aggression go back a few steps. Scent swap for a few days and start visual contact slowly again. When to contact your vet about introducing cats? Resource guarding is when dogs feel they have to guard their food, toys and other things from people or dogs. It’s an innate feeling that they have to guard something, as if like their life depended on it. You can help prevent resource guarding from becoming a bad habit for your dog by teaching them when they’re puppies that it’s fantastic to have things taken from them. Looking for more information on why a dog might be aggressive? Download our Aggression to people – Reducing and managing dog aggression towards people (PDF) guide. The beauty of dogs is that they are social animals who adapt to our lives. They come in every shape and size you can imagine. Our job as a guardian is to care for them, train, understand their behaviour and protect them. Dogs are wonderful companions who we need to keep happy & healthy. Learn the best way to welcome a new dog into your home. Puppies need good quality puppy food. Adult dogs will thrive on a quality dry kibble. Consult the feeding guidelines provided on the bag or can for how much your dog should eat in a day. It is common for most dogs to eat twice a day — in the morning and at dinner time. Puppies may need three meals a day. Some dogs need special diets. Talk to your veterinarian about the best diet for your dog. Dogs love treats. They’re important when training your dog. Use treats to reward your dog when he gets something right. It’s like saying thank you or paying him. You can even use your dog’s kibble as treats- they won’t know the difference. Save the yummy treats for things like calling him back to you or when he’s at the vet and nervous. Your dog must have access to fresh water all the time. Change the water daily and wash out the bowl regularly. All dogs, whether short or long hair, need grooming. Longer haired dogs need to be brushed daily to keep mat free. Some might need to go to a dog groomer for grooming. Regular brushing will help you detect fleas or any lumps, bumps or skin conditions your dog may have. Just like humans, dogs need their teeth brushed for good oral hygiene. They can’t do it themselves so we have to brush their teeth. Use a soft tooth brush and dog tooth paste and try to brush every day. Never use human tooth paste. Go slow and make sure you have treats to give your dog after his brushing. All dogs need exercise, no matter how big or small. Different breeds of dogs need different amounts of exercise but they all need to run and play every day. One or two short walks for a bathroom break is not enough. Leaving a dog in a back yard is not enough. Playing fetch, or taking your dog to an off-leash park where he can run around safely is best. If you’re not sure how much exercise your dog needs talk to your vet. Nobody plans to lose a pet. Prepare for the unexpected and ensure your dog has two forms of identification. It is also important to have your dog licensed – it’s the law. The license number will help people find you if your dog is lost. Check with your city, municipality or regional district about licensing and where to buy one. Where should your dog sleep? Indoors or outdoors? Dogs should be kept inside with their family. They are social animals who like to be around people. 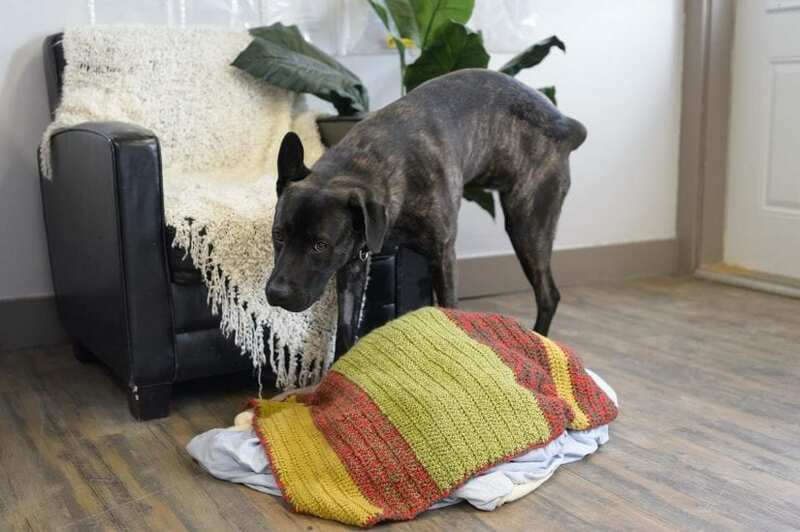 Set up an area with a comfy bed or blanket that your dog can call his own. If you let your dog outside in a yard, it should only be for short periods of time. He should have a warm, covered place, away from wind, sun and rain. He must also have a dry place to lie down and fresh water. Best never to leave your dog outside unattended. If your dog is outside, learn what kind of shelter he needs. When you first get your dog, take them to see a vet. After the initial visit with the vet, you should plan to go back at least once a year for a check-up and vaccines. Puppies will need to go back more often at first for vaccines. Always watch for lumps and bumps, your dog not eating or a change in their behaviour. If you notice anything different talk to your vet. Find a veterinarian in your area. Learn how to make your dog or puppy’s vet visit less stressful. A dog needs to learn what we want him to do or not to do. Learning about his behaviour and how to teach him what you want is one of the best things you can do for your dog. If he knows exactly what you want he’ll be happier and safer. Never use harsh verbal or physical corrections training a dog. Choose a humane trainer who follows the BC SPCA Position Statement Animal Training. Did you know the BC SPCA has standards for humane dog training (PDF)? We can help you find a good dog trainer through our AnimalKind program. Some dog behaviour is normal for a dog but we find it annoying or think it’s bad. Other times dogs have behaviour issues. Jumping up, being afraid of people or things and reacting are just a few issues we see regularly. 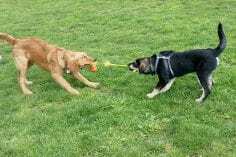 We can help dogs, by better understanding and managing dog behaviour and ensuring they get enough exercise, enrichment and training. ​What do I do if my dog has separation anxiety? Dogs form strong bonds with animals and people with whom they live. Most dogs can cope with separation from family members for a few hours. Some feel anxious, stressed, even panicked when left even for a few minutes. Never punish your dog when she is anxious. She is not destroying things on purpose. Separation anxiety is a type of illness that is highly treatable with a combination of medication and behaviour modification (behaviour therapy). Your veterinarian can help determine whether your dog has separation anxiety or another condition. Learn more about how you can deal with Separation anxiety – Preventing and reducing dog anxiety when alone (PDF). ​What is a Hide, Perch & Go™ box? 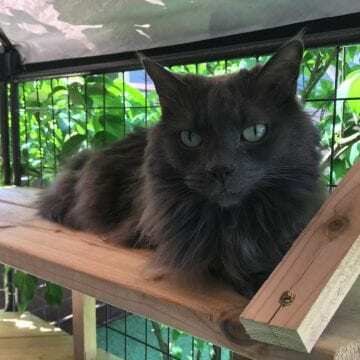 To help cats cope with the stress of being at a shelter, the BC SPCA developed the Hide, Perch & Go™ box. 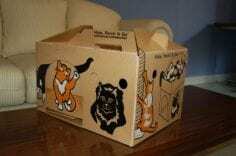 The box provides cats with more control over their limited environment and allows them to express behaviours such as hiding, perching and face rubbing (scent marking). All of these are natural cat behaviours that help reduce stress. The Hide, Perch & Go™ box is included with the adoption of your new feline friend! Learn more. Start slowly. Your dog needs to get used to being indoors. Put a leash on her and bring her inside for short periods, even for just a few minutes to give her a tasty treat. Toss treats in the doorway to encourage her to enter if she is too nervous. Never force her. Gradually have her spend more time inside with you. Once she is relaxed, give her time off leash in the house. Provide your dog with a mat when you feed her outside. Feed your dog each meal on the mat; she can be standing, sitting or lying on the mat. Remove the mat once she is finished eating. Bring it out again with the next meal. Once she is comfortable eating on the mat, bring it indoors along with your dog on a leash at feeding time. Feed her on the mat in the house. If she doesn’t want to come inside, continue feeding on the mat but move it closer to the door. Toss treats in the doorway for her to eat, while allowing her to go back outside if she’s too nervous. Your goal is to have your dog eating on her mat in the house and relaxing. Learn how to house train an adult dog that is used to living outdoors. Was your dog outdoors because of a behaviour problem? Learn about dog behavioural issues and how to fix them. What are some issues with keeping a dog outdoors? Spaying or neutering your dog, cat or rabbit doesn’t just help prevent accidental litters. It also has health and behavioural benefits for your pet. Neutered dogs are calmer and less likely to bite, attack or get into dog fights. Neutered cats and rabbits don’t have the drive to mark and protect their territories and are less likely to spray or get into fights, resulting in fewer injuries. Heat cycles are usually twice a year for dogs, and result in many unwanted behavioural changes including possible aggression. Cats generally go in and out of heat every three weeks between January and November. Female cats in heat can howl relentlessly, may try to escape to mate, spray or urinate inappropriately and attract unwanted male cats. Studies show that spayed/neutered pets, on average, live longer. Spaying eliminates the risk of ovarian and uterine cancer and pyometra (life-threatening infection of the uterus) in dogs, cats, and rabbits. Up to 80% of unspayed rabbits will develop uterine cancer. Spaying reduces the risk of mammary cancer in cats, dogs, and rabbits. Neutering eliminates the risk of testicular cancer in all species and lowers the risk of prostate problems in male dogs. The likelihood of your male pet wandering away or escaping will be decreased. Male dogs can smell a female in heat up to a kilometre away. Once neutered, your pet will be less frustrated and may become a calmer companion. Other procedures, as necessary, can also be done at the time of the operation. This includes procedures such as an identification tattoo or microchip, teeth cleaning, hernia repair and baby teeth removal. Research shows that the majority of cat pregnancies are unintended. Pregnancy is hard on the mom physically. Prenatal care, birth complications, and puppy/kitten care can be costly. Research shows that, as an individual, you help reduce overpopulation issues in your community when you spay or neuter your pet. Spaying and neutering your pet helps reduce the number of stray or unwanted animals in your community. Reducing the amount of stray animals helps prevent other pets and wildlife from being injured or killed in fights. Fixing your pet helps lessen the amount of stray animals getting into or causing car accidents, getting into garbage cans and damaging property. Learn how fixing your cat helps combat the cat overpopulation problem and how you can take action in your community. But aren’t there also some risks to spaying and neutering? Yes, any surgical procedure carries some risks. However, the overall benefit outweighs the risk for most animals. Talk to your veterinarian about the best choice for your pet. Risks of surgery and anesthesia include pain, bleeding, infection, the incision opening up, or a bad reaction to the drugs used. Spaying and neutering removes reproductive hormones from your pet’s body. This has many benefits but also has minor effects on bone development and other body systems. Several recent studies show higher rates of some bone and joint problems and cancers in purebred dogs spayed and neutered as puppies. These studies have attracted a lot of attention. The studies involved small numbers of dogs who were already predisposed to the problems being studied because of their breeds. More research is needed to understand these risks. If you are concerned about risks of spaying and neutering, don’t just consult the internet. Talk to your veterinarian about what is best for your pet. Shouldn’t a female cat/dog have a litter before being spayed? Will spaying/neutering change my pets personality? Will my pet become fat/lazy once it is fixed? What does spay or neuter mean? When should my cat/dog/animal be fixed? What does it cost to spay/neuter my cat/dog/animal? Find out more about the benefits of sterilizing your pet and how February is spay/neuter awareness month. 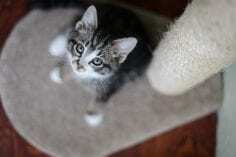 ​What is toxoplasmosis/how is it transmitted? Toxoplasmosis is an infection caused by a tiny parasite, Toxoplasma gondii. It can infect both cats and people, but most healthy animals and people won’t get sick because their immune systems will protect them. Most people who get toxoplasmosis get it from eating undercooked meat or unwashed produce. Because cats only shed the parasite for the first few days after becoming infected, infection from cats is rare. Pregnant women and people with compromised immune systems are more at risk for infection. If a pregnant woman becomes infected, her baby may have health problems. Can pregnant women be around cats? Still concerned about your pet and your baby? If you have more questions or concerns about toxoplasmosis and your baby’s health, please talk to your doctor. If you are concerned about toxoplasmosis and your pet’s health, please talk to your veterinarian. Shelter medicine is a field of veterinary medicine that combines individual animal health care with the needs of the population. Shelter medicine is an exciting, growing field that is now being taught in many veterinary schools. Shelter medicine recommendations may differ from private practice recommendations, because of consideration for the entire population and not just individual animals. The BC SPCA has a shelter medicine program that provides provincial support to all sheltering branches using an evidence-based approach. Our program also hosts 4th year veterinary students from across the world who are interested in learning more about animal welfare and shelter medicine. Visit our Professional Resources page for more shelter medicine information. ​How to stop my cat from scratching the furniture? Most cats love to stretch and scratch something. Scratching is important for cats, it’s a natural behaviour. Scratching also helps shed the outer covering on their claws and scent mark. Instead of trying to stop them from scratching, give them something to scratch (PDF). Put scratching posts close to an entrance or near where your cat sleeps. They usually stretch and scratch after waking up or when entering a room. If they’re using your couch as a scratching posts, interrupt them. Don’t scare them. Interrupt and get them to scratch their post. Make sure to reward them for scratching their post. Never use harsh verbal or physical corrections with your pet. If you feel like nothing is helping, talk to your vet about safe and humane nail covers. The BC SPCA is against declawing cats. Cat’s nails are not like fingernails, they’re attached to the bone. Declawing is a serious surgery. It’s like removing a part of your finger at the knuckle. Read the BC SPCA position statement on cosmetic and other non-therapeutic alterations (PDF). ​How can I tell if my cat is sick? Sometimes it’s hard to tell if your cat is sick or injured. The signs that she’s sick might not be obvious. Cats have evolved to try and conceal when they are sick. Watch for the signs below and call your vet if you’re not sure. Make sure your cat has regular vet exams to prevent illness. Obvious illness or injury: vomiting, diarrhea, coughing, sneezing, wounds, limping etc. ​Do I need to take my new cat/dog to the vet? Yes, with a new pet it’s always a good idea to take them to a veterinarian to make sure your new friend is healthy. You can also get all your questions answered about vaccines or health concerns. Call your vet to ask when to schedule your first visit. Make sure you bring your pet’s favourite treats and don’t feed a big meal before going to the vet so your pet is excited to get treats. You want your puppy or kitten to love the vet and not be scared, and the best way to do this is to make it a great experience every time! ​How to house train a puppy? Puppies are a lot of fun and, like toddlers, they need to learn where to go potty. Remember it’s up to us to teach them and reward them when they get it right. When house training your puppy, consider training him to like a crate. Crates can help with house training and chew training. Never punish your puppy for not going where you want or for not doing what you want him to do. We have to teach animals what we want them to do. If he doesn’t stay by your side he may not know that’s what you want. Reward him when he’s beside you. Use lots of treats and when he’s older you can use treats and life rewards. Why does my dog not like people petting him? When we do human things to dogs like petting them, we have to make it worth their while. Dogs aren’t born liking being touched and might not want to be pet by us. If your dog used to like being petted and now doesn’t, she might be sore or have a medical problem. Check with your vet. No, buying an animal you have never seen in person can be dangerous (PDF). In pictures and descriptions, the animal might appear to be cute, happy and healthy. However, once you’ve exchanged money and the animal is shipped to you, you might be in trouble – search for animals to adopt from your local BC SPCA shelter instead. The animal might not be socialized to people or could have behaviour problems. This means they could bite or scratch and might never enjoy your company! An animal that looks healthy can be deceiving. They could have worms, parasites or even genetic diseases (PDF) with high costs and long-term heartache. What if the animal isn’t a good fit with you and your family? Are you prepared to put them through the process of being returned? What would you do instead? If you’re buying from a rescue, make sure you meet the animal in person – even if you have to drive for many hours to do so. 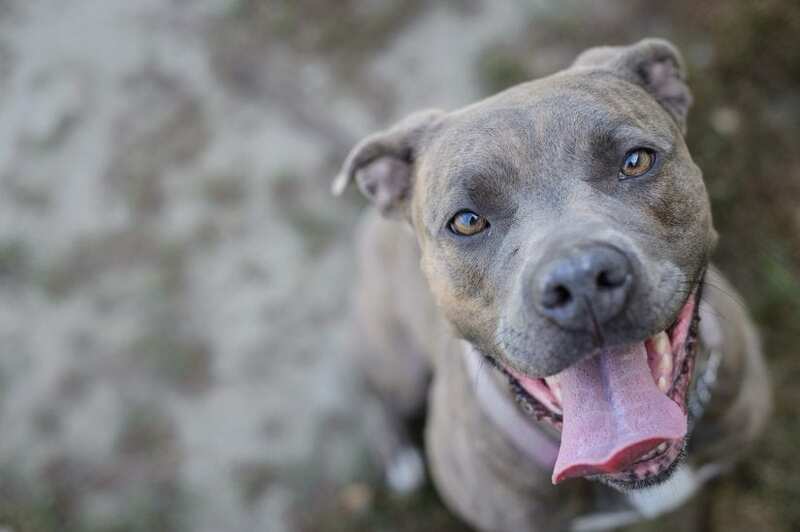 Ask the rescue some key questions to make sure this animal is a good fit for you and your family. If you’re buying from a breeder, visit the breeder’s home and facility. Do not trust pictures or scans of documents, these can easily be falsely created. ​How do I find a good breeder? If a breeder asks to meet you in a shopping mall, parking lot or somewhere else away from their breeding facility to get your new pet, DO NOT purchase from this person. Print out our guide (PDF) to take with you to a breeder’s home or facility. Have you been lied to by a breeder? Report them. Call the BC SPCA Provincial Call Centre 1-855-622-7722. ​Why does my dog get jealous of the baby? We know dogs do what works, which means they learn how best to get your attention, like jumping, for example. If your dog is doing this when there is a baby around, maybe she has learned to jump up to get your attention. This isn’t jealousy, however it does mean you need to do some training with your dog. Don’t assume that what looks like jealousy, is truly jealousy. Many dogs are not comfortable around babies and may be scared of them. If your dog seems scared, don’t force her to interact with the baby. Some dogs will guard things they feel are “valuable” objects. A valuable object to some dogs can be anything from a kleenex, to a sock, toy or bone. If your dog does this, be extra careful. Never allow your baby (or any child or other animal) to approach the dog when she has their valuable item. If your dog is reacting aggressively to babies, children or other dogs, you should never use verbal or physically harsh punishment. If she is doing things like growling, snarling or even snapping, she’s giving signals. She’s telling you that she isn’t comfortable. You have to listen and never punish her for her behaviour. Seek professional help – a veterinarian, applied behaviourist or reward-based trainer experienced with dog aggression. Did you know the BC SPCA has standards for humane dog training (PDF)? We can help you find a good dog trainer through our AnimalKind program. Before bringing baby home, help your dog get used to the sounds and smells of babies. Do basic training with the dog. Teach her do things like leave it, go out of a room, settle, etc. Set up your home with gates and a safe place (such as a crate, bed, or room) for the dog to retreat to. Use praise and treats to help the dog associate the baby with good things. Don’t reward attention-seeking behaviour like barking, jumping and begging. Include the dog in walks and playtime with baby. Let the dog get used to the baby gradually and at her own pace. Never force them to interact. Never leave your dog and baby alone together, even if your dog is small. Pay attention to what your dog is telling you. If your dog is afraid or acts aggressive, seek help from a professional. ​Should I get a second dog? Is your dog ok with another dog living in his home? Does he just like his doggie friends at the park? Maybe fostering a dog will help you and your dog test the waters? What are the extra costs of having a second dog? You may think it’s a great idea however your dog may not want a live-in buddy. How to interact with small pets? It’s important to build a relationship of trust with your small pets. We like to pick them up and cuddle them, but small pets are prey animals. This means they’re hunted by others for food and the only time they’re picked up is when they get caught. Respecting them will help you gain their trust so you can pick them up and pet them. ​How do I teach my cat to walk on a leash? Many cats like going outside and one way to keep them safe is to teach them to walk on a leash. Before you take them outside, get them used to wearing a harness. Most cats have never had something wrapped around their body like a dog has. Don’t force them to wear the harness, teach them to want to wear it by learning the best way to put a harness on a cat. Once your cat likes the harness, then start taking them outside for short visits to quiet places. If your cat has never been outside before, this could be scary for them. Always take a pet carrier with you so your cat can jump in and hide if they’re scared. Don’t forget to make sure your cat has ID before taking them outside! We recommend that all cats have a microchip, plus a visible form of ID such as an ear tattoo or a breakaway collar with an ID tag. ​Should I adopt one kitten or two? It’s always a good idea to look at the benefits and the costs when considering adopting a second kitten. A young kitten will do better with another kitten, but it will cost a bit more because you’ll have two. It’s not always extra work when you adopt two, but it is double the fun for you. Find a second kitten through the BC SPCA’s adoptable animals page. ​How can I make my dog/puppy’s first visit to the vet a good experience? The veterinarian’s office doesn’t have to be a scary place for your dog or puppy. Treats, a towel and plenty of petting can help. Not to mention lots of love! ​I found a kitten, how do I take care of it? Start with determining their age, then decide if you should leave them with mom, take them in, or call the BC SPCA. If they are very young, it’s safest to leave them in place until you can determine whether their mom is still caring for them. If you do take them in, their care will depend on their age. 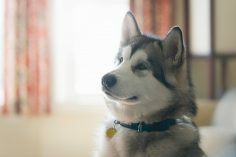 ​How to choose a dog trainer? 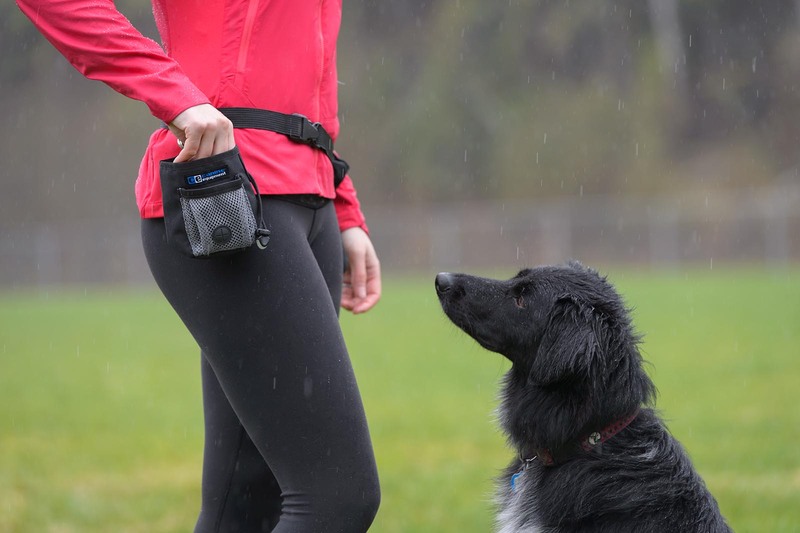 Reward-based training methods are shown to be more effective and better for your dog. Choose a trainer who uses only humane, reward-based methods – this means the trainer will never use fear or pain to train your dog. 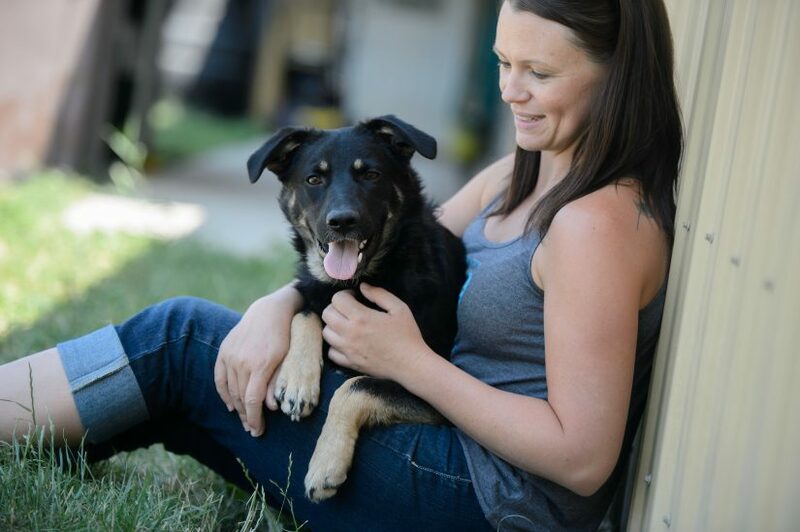 The BC SPCA has standards for dog training and we recommend choosing a trainer who follows our standards and is accredited by our AnimalKind program. See if a BC SPCA-recommended AnimalKind dog trainer is in your area, and read our standards (PDF). If an AnimalKind trainer is not in your area, look for a trainer that uses motivators like treats, food and play. Avoid trainers that use harsh verbal or physical corrections to punish your dog for unwanted behaviour. Good trainers understand how dogs learn, know their behaviours and what motivates those behaviours. They will want to support and encourage you as you learn to train your dog. Read a more detailed checklist on choosing a trainer. 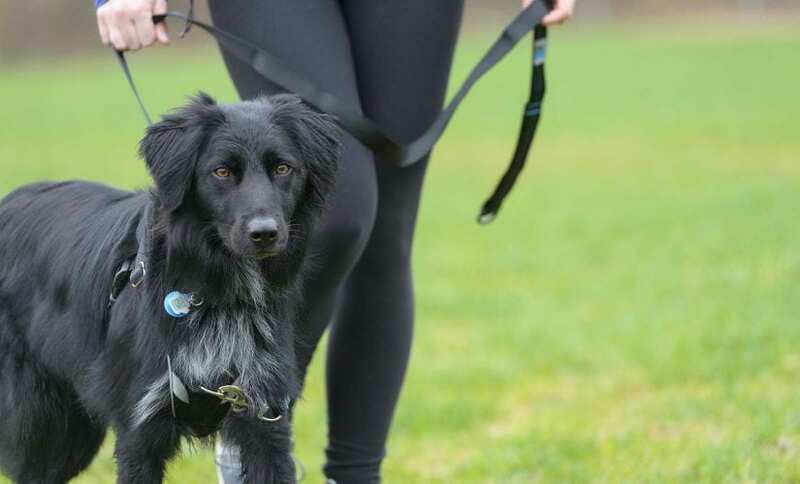 The BC SPCA supports evidence-based force-free, humane training, and opposes training methods or equipment that cause anxiety, fear, distress, pain or injury. Learn more about the BC SPCA’s position on Animal Training. ​What do I need for my new puppy? Puppies need patience, time and supervision. Start with planning what you will need and what your pup will need when they come home. Puppy proof your home so your puppy doesn’t get into things it shouldn’t. Plan where you want your pup to go to the bathroom and give them treats when they go in that spot. Crate training is an easy way to help housetrain your pup and prevent him from getting into things. When you bring pup home, start handling and giving him treats after so he learns handling is a good thing. How to socialize my puppy? Don’t forget, if your puppy is under 12 weeks he’s at an important time in his life. Socialize him now and give him good experiences so he learns the world is a fun and safe place. ​How do I stop my dog from jumping on me all the time? Sometimes, dogs can get overly excited while out and about, jumping up on you or others. We need to understand why they’re doing that and how we can teach them to do something else. ​I’ve got a new cat, what do I need? Congratulations! Cats are wonderful companions and giving a cat a home is a wonderful event. A new home with new smells, people and furniture means your cat may feel anxious, stressed and scared. When you arrive home, go straight to a small room where the cat can stay for a few days. There should be no places to hide in this room except for a crate. The room should have a litter box, food and water bowls. Cats do not like to eat near their litter box so keep the food bowls and the litter box away from each other. Open the crate and let your cat out. Let her explore the room. Leave your cat in the room. You may be excited but being patient for a few days is the best and most loving thing you can do. Every cat is different. Some may show you love and climb on your lap right away. Others may stay in hiding and watch you from afar until they feel safe. Take your cues from your cat. Let her make the decision about how much interaction she’s comfortable with. The adjustment may take hours, days or even weeks. Learn more about how you can welcome home your new cat and bond with them (PDF). ​What is rabies/how is it transmitted? Rabies is a viral disease of warm-blooded animals that can be transmitted to humans. It is caused by a virus of the Rhabdoviridae family, which attacks the central nervous system and eventually affects the brain. Rabies is almost always fatal in animals and people once symptoms occur. How is rabies transmitted between animals and humans? The virus is transmitted through close contact with the saliva of infected animals, most often by a bite or scratch. It can also be transmitted by licks on broken skin or mucous membranes, such as those in the eyes, nasal cavity or mouth. In very rare cases, person-to-person transmission has occurred when saliva droplets became aerial. Bat bites can inflict small wounds and go unnoticed. Who is at risk of being infected by rabies? The rabies virus can infect any mammal. In North America, it occurs mainly in foxes, skunks, bats and raccoons, and can spread to domestic livestock and pets. In B.C. however, the only carrier of rabies is bats; no raccoons or skunks in B.C. have ever transmitted rabies. How common is rabies in bats in B.C.? It is estimated that 1 percent of bats in the wild in B.C. carry rabies. In June 2004, four skunks in Stanley Park in Vancouver tested positive for the rabies virus. However, it was discovered that they all carried the bat strain of rabies; likely they had all been in contact with a rabid bat. In 2000 and 2003, two people in Canada died of rabies infection, one in Quebec (2000) and one in British Columbia (2003). These were the first cases of human rabies in Canada since 1985. The most likely sources of infection for both individuals were unrecognized bat exposures. Without wound cleansing or post-exposure vaccinations, the potential incidence of rabies in exposed humans can be very high. Does my pet need a rabies vaccine? Dogs and cats account for fewer than 5 percent of all animal rabies cases in Canada. However, rabies presents a serious public health risk, and even indoor pets could come in contact with a bat. Some pets also need the vaccine for travel. Ask your vet whether your pet should be vaccinated. What if my pet brings a bat home? If your pet brings home a bat you should take your pet to a veterinarian. If the bat is available, your vet may send it for rabies testing. 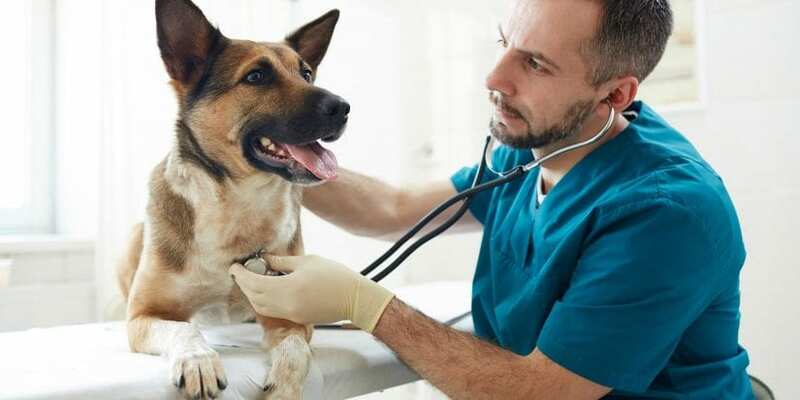 Additionally, your vet may vaccinate your pet against rabies and/or ask you to keep your pet in your home for several months to see if they develop signs of rabies. If any person in your household has touched a bat with bare skin, seek medical attention from a doctor or local public health unit immediately. What will happen to the bat? The bat may be euthanized and sent for testing. As of April 1, 2014, CFIA veterinary inspectors are no longer involved in species collection activities. However, CFIA continues to perform and cover the cost for rabies laboratory testing involving domestic and wild animals and humans. This is vital as once the symptoms of rabies (flu-like including fever, headache, fatigue, progressing to GI and CNS problems) start to appear, there is no treatment and the disease is almost always fatal. However, wound cleansing and immunizations, done as soon as possible after suspected contact with an animal, can prevent the onset of rabies in virtually 100 percent of exposures. Immediately wash the wound or exposed surface with soap and water for 10 minutes and cover the area with a clean bandage. Remove any clothing that may have been contaminated. Immediately call your doctor and local health authority for advice. Please contact your veterinarian to have your pet vaccinated and discuss whether a period of isolation/ observation is required for your pet. If the bat is available, your veterinarian may send it for rabies testing. ​How do I train an aggressive dog? A dog may show aggression like growling, barking, lunging or biting for many reasons. Aggression is a normal dog behaviour but it can cause stress, injury or pain to your dog, you or others. Most aggression comes from fear. Look for things your dog reacts to aggressively and stay away from them. Strangers, men, dogs or someone trying to pet him might be scary. If they’re too scary your dog might react to make them go away. Learn how to reduce and manage aggression towards people (PDF) or aggression towards dogs (PDF). Put safety measures in place to protect other people or dogs from getting hurt. If your dog has bitten someone or another animal, teach him to wear a muzzle so you feel safe and others are safe. Muzzles are OK. Ask your vet or a reward-based humane trainer for help. Did you know the BC SPCA has standards for humane dog training (PDF)? We can help you find a good dog trainer through our AnimalKind program. Read the BC SPCA position statement on animal training. It takes time to help change a reactive dog’s behaviour. Here are some tips for dealing with dog reactivity. ​I can’t find pet-friendly housing. Can you help? The BC SPCA recognizes that pet-friendly housing is limited in B.C. To make it easier to demonstrate responsible guardianship and work together to create humane communities, we have developed resources to help renters demonstrate themselves as good guardians and also make it easy for strata councils and property owners to effectively manage their buildings and suites. Learn more about finding pet-friendly housing for you and your pet. ​I am leaving an abusive situation, can you take my pets until I get back on my feet? 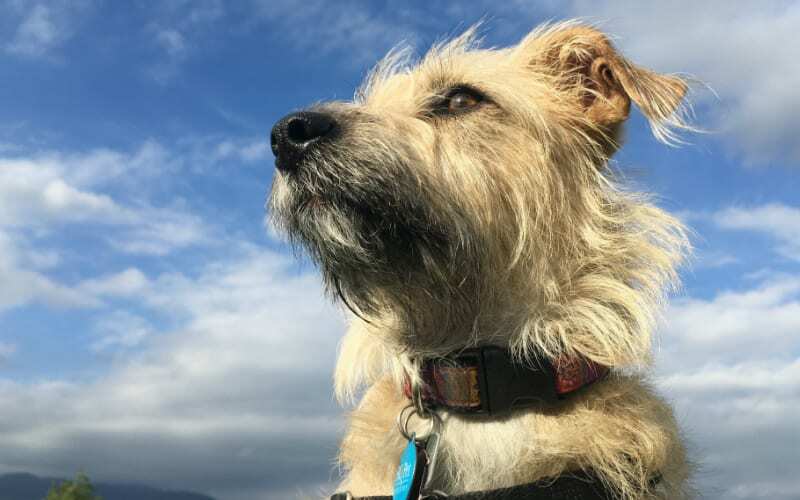 Yes, some BC SPCA shelters may be able to provide temporary care for your pets under certain emergency circumstances. Contact your local shelter to discuss options including how they can help. Please note that our ability to help you may be affected by the current number of animals in our care and the resources available at the shelter. Can I temporarily give my animal to the BC SPCA? Yes, some BC SPCA shelters may be able to provide temporary care for your pets under certain emergency circumstances. Contact your local shelter to discuss options, including how they can help. Please note that our ability to help you may be affected by the current number of animals in our care and the resources available at the shelter. A relative died. What do we do with their pet? Our sympathies for the loss of your loved one. If there is an animal left after a death, you have a few options including trying to find a new home for the animal. 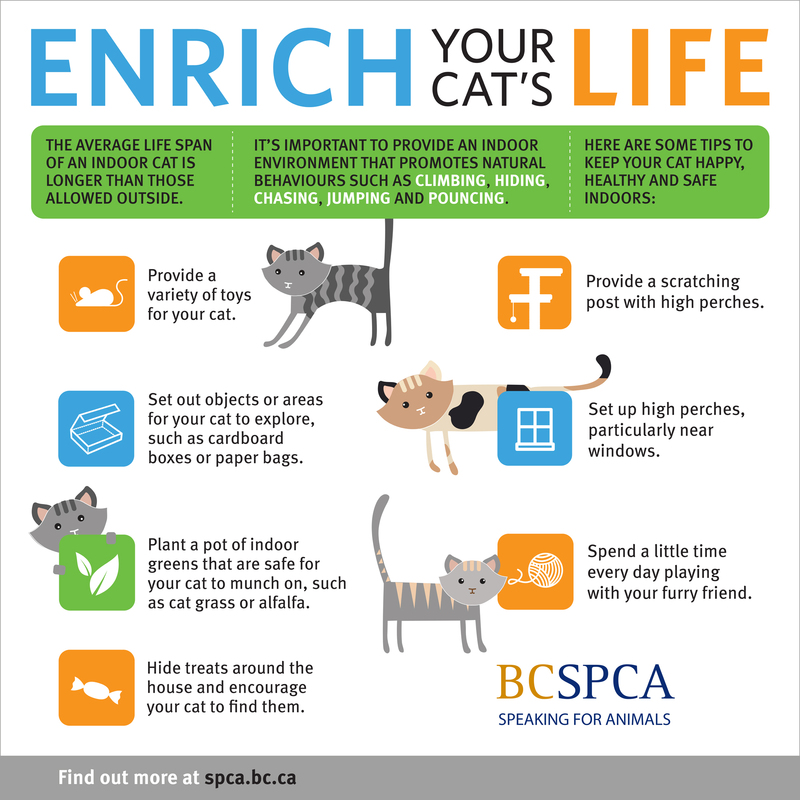 If you need the help with that, a local BC SPCA shelter may be able to help you. Aggression is a normal behaviour for dogs, but some aggression is treatable. Talk to your vet or force-free humane trainer who adheres to the BC SPCA Position Statement on Animal Training. Then call your local BC SPCA shelter to see if they have the resources to help you and your dog. The BC SPCA is not able to accept donations of pet medications that have been previously dispensed or used. These medications should be taken to a pharmacy for disposal. ​Do you recommend pet insurance? Yes, the BC SPCA recommends pet insurance. In fact, with every dog and cat adoption, you get a complimentary six-week trial of pet health insurance provided by Petsecure Pet Health Insurance. With pet health insurance, you can lower the stress of paying for large, unexpected or unplanned expenses with a monthly premium. 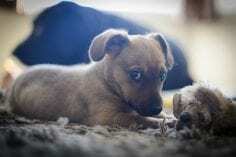 ​What does it cost to spay/neuter my cat/dog/animal? The cost of spaying or neutering your pet depends on many factors and will vary according to each pet’s circumstances and needs. For example, a large dog will cost more than a small dog. If your pet is overweight or in heat this can also add to the cost. Contact your veterinarian to get a more accurate idea of the costs involved for your pet. The cost of spaying/neutering is small when compared to other costs of pet care, such as what you will spend on food for your pet over their lifetime. Consider the possible costs if you do not spay or neuter. If your pet should wander off in search of a mate, you may be faced with paying fines and impoundment fees. You may also be faced with the additional costs of caring for puppies or kittens for whom finding homes may be difficult. Worse yet, think of the costs should your pet be injured while roaming for a mate. Spaying or neutering is a one-time investment with life-long health and welfare benefits for your companion. If you require financial assistance, learn about low-cost spay/neuter programs in B.C. Vaccines protect your pet from getting diseases that are contagious and possibly fatal. Vaccinating your pet doesn’t just protect your pet, it also protects other pets in the community who may be too young or sick to be vaccinated. Vaccines also protect against some diseases that can be passed from pets to people. All cats and dogs should receive vaccines. Your veterinarian can help determine which vaccines are necessary and the best schedule for vaccinating based on your pet’s lifestyle and age. Talk to your veterinarian about vaccines for your pet. When is it safe to vaccinate my cat/dog/animal? Puppies and kittens should start their vaccines at six to eight weeks of age. Your puppy or kitten will need a series of vaccines before they are four months old. Schedules for adult animals may vary depending on lifestyle and vaccines needed. Shelter or rescue animals may require more frequent vaccines while they are in the care of a shelter due to higher risk of exposure to disease. Talk to your veterinarian about when to vaccinate your animal. Allowing a female cat or dog to produce a litter does not have any benefits to the animal. Animals who go through heat cycles and pregnancy are at higher risk for uterine and mammary problems, including mammary cancer, which can be fatal. There are health risks to the mother during the pregnancy and when giving birth. Proper pre-natal care, emergency care for birth complications, and proper newborn care are expensive and time-consuming. Learn more about the benefits of spaying and neutering your pet. Will spay/neutering change my pets personality? Generally, spaying or neutering your pet will not change its personality. If there are any effects on behaviour, they tend to be positive (reducing unwanted behaviour). Spaying or neutering will not change your pet’s affection level or playfulness. For females, there is typically no change at all. For males, there may be a reduction in some aggressive and roaming behaviours. If you have more than one pet, you will find they often get along much better if they are all spayed or neutered. Most unintentional litters (particularly with cats) occur because guardians waited too long to have the surgery done. The usual recommendation is before six months of age for cats, and before six and a half months for dogs. Consult your veterinarian to determine the best time for your pet. Female cats and dogs do not have to have a litter before being fixed. The BC SPCA supports early age spay/neuter procedures for dogs and cats. Pediatric sterilization prevents excess litters by ensuring animals are sterilized before adoption. This helps combat pet overpopulation and euthanasia of unwanted animals. All major professional, academic, and animal welfare organizations in North America support pediatric spay/neuter for shelter animals. 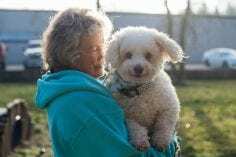 The BC SPCA will continue to promote other methods of combating pet overpopulation, including education and public awareness campaigns, non-surgical methods of sterilization, traditional spay/neuter initiatives and behaviour training. “Spaying” and “neutering” are surgical procedures used to prevent pets from reproducing. In a female animal, “spaying” consists of removing the ovaries or uterus and ovaries. The technical term is ovariectomy or ovariohysterectomy. For a male animal, “neutering” involves the removal of the testicles, and this is known as castration. In addition to preventing unwanted offspring, spaying or neutering has many health and behavioural benefits to the animal. Can I adopt an animal as a gift for someone? What does it mean to foster an animal? How do I apply? Fostering an animal means you take a BC SPCA animal into your home and care for them for us. While they’re in your home, we provide you with food and medical care until the pet is available for adoption. 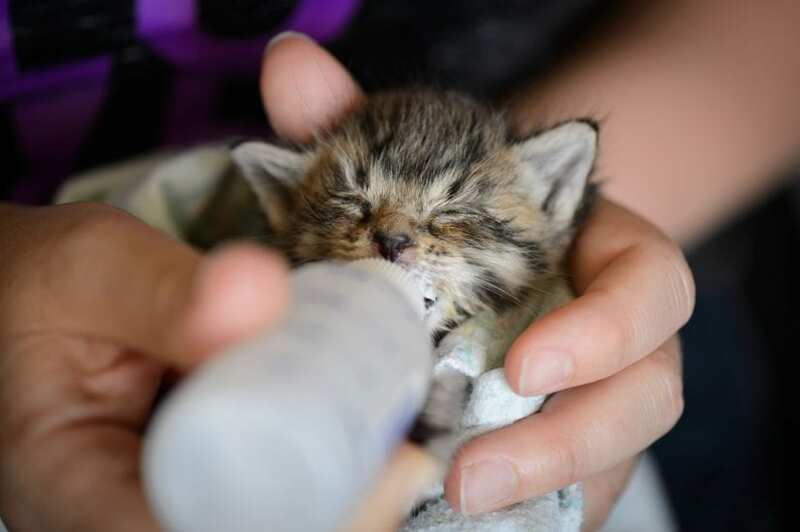 Foster families help animals recover from illnesses/injuries or provide them with socialization and love. 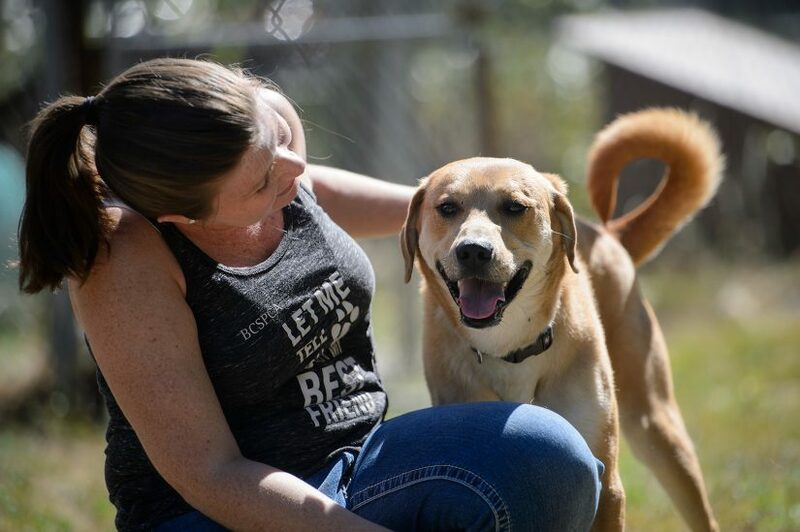 If you are unsure about adopting an animal, or unable to make the commitment at this time, fostering can be a great way to bring animals into your life. If you are 19 years of age or older, you can view foster care opportunities and apply to become a foster guardian. Learn more about our program, download fostering for the BC SPCA (PDF) and watch the video below. For questions about fostering horses and other farm animals, email rescues@spca.bc.ca or fill out our horse and farm animal foster application form. How do I take my adopted cat home? Don’t worry about bringing a carrier or something to take your cat home in. We provide what is called a Hide, Perch & Go™ box for you to take kitty home in. What is a Hide, Perch & Go™ box? 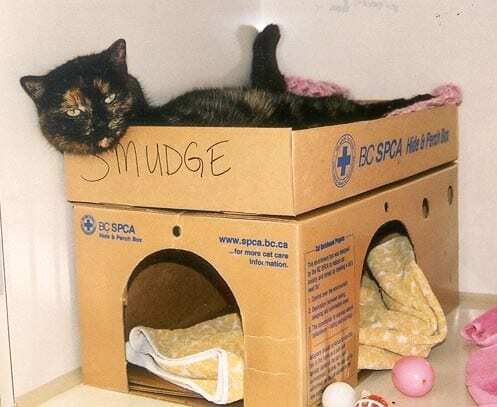 To help cats cope with the stress of being at a shelter, the BC SPCA developed the Hide, Perch & Go™ box. The box provides cats with more control over their limited environment. The box allows them to express behaviours such as hiding, perching and face rubbing (scent marking). All the natural cat behaviours that help reduce stress. As the box gets saturated with their own scent, cats feel safer and more at home. Taking their box home with them will help lower the stress from moving into a new home. New smells, people and furniture can make a cat anxious, stressed or scared. Something that has their scent and they’re familiar with will them adjust to their new home. 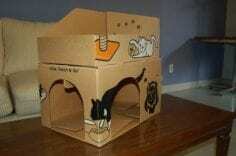 The box is designed so a cat can hide inside, perch on top and scratch or rub the sides of the box if they want. 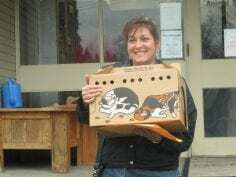 When you need to take your cat home from the shelter the box converts into a carrier. Once home you reassemble the box into a place where your new kitty can hide, perch, rub or scratch. And it isn’t something new, it’s something with their own scent on. Follow the same steps in reverse to turn your Hide, Perch and Go™ box back into a pet carrier. Looking for a new cat? Visit the BC SPCA adoptable animals. Work with animals and want to purchase Hide, Perch & Go™ boxes? Find out how to order Hide, Perch & Go™ Boxes for your veterinary clinic, hospital or shelter today! ​How do I register my pet’s ID in case it gets lost? Register your pet’s microchip, tattoo or license with the BC Pet Registry. 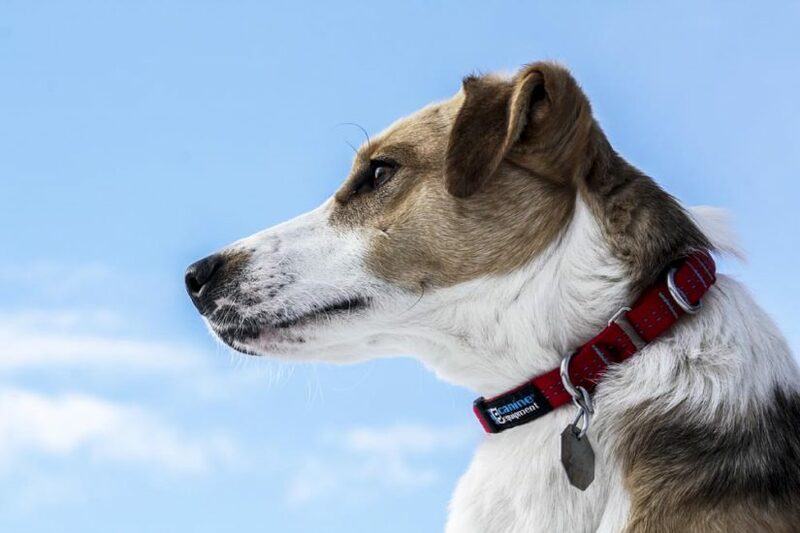 Submitting your pet’s information to this provincial database ensures your pet is traceable by all participating veterinarians, animal control agencies and humane societies. 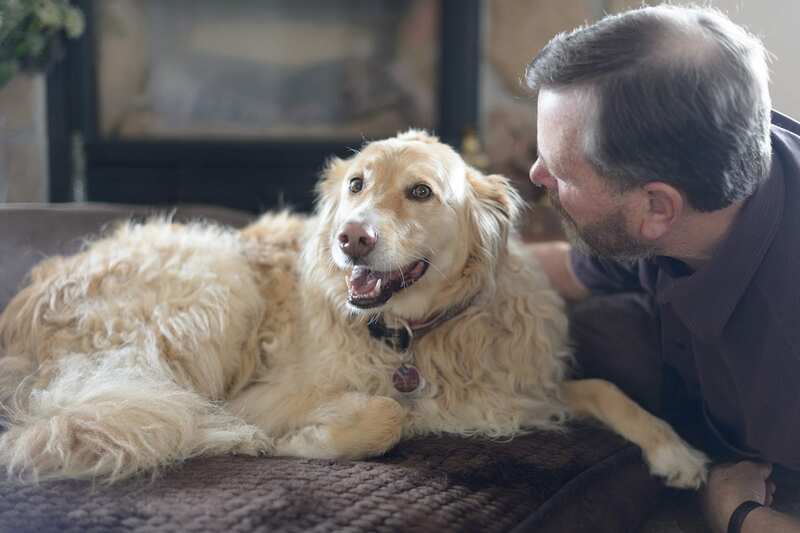 Find out more about how permanent pet ID can help ensure peace of mind. Have you moved or changed your phone number? Keeping your contact information up-to-date is easy with the BC Pet Registry. Registered users can also add additional forms of ID to their existing pet profile free of charge. To report a lost pet, please contact your nearest BC SPCA branch. How do I litter train my cat/kitten? Cats are not born knowing how to use a litter box. Kittens learn about the bathroom from mom. When we give them a plastic box with litter in it we have to teach them to use this as their bathroom. Pet your cat, give a him a treat or engage in a play session every time he uses the litter box. Never punish your cat or scare him for inappropriate elimination. Not using a litter box is one of the most common cat behaviour issues guardians deal with. Recognize when there is an issue and try to solve it. Your cat may stop using the litter box for medical, behavioural or emotional reasons. Put the litter box in a convenient and quiet area for your cat. Make sure the litter box is the right size and type for your cat. The rule of thumb is that a litter box should be one and half times the length of your cat. Go bigger if you’re not sure! Most cats prefer soft small grained litter. Your cat may prefer one litter over another, so when you find what he likes, stick with it. One way to see what he likes is to put several litter boxes out with different litter and let him choose. If you have multiple cats you should have one litter box per cat, plus one extra. Take him to his litter box after meals and naps until he gets the idea. If his box is in a separate room, put him in the room and close the door after meals and naps. Give him a treat after he uses his litter box. Scoop litter box daily and depending on the litter you use wash box every one to two weeks. If your cat has an accident never yell or hit him. Go back to step one or check out “My cat won’t use the litter box, what should I do?”. It’s important to remember your cat’s litter box is a big part of her life. Keep it clean so that she enjoys using it. Learn about cat litter box maintenance. Need more information? Download Litter box problems treating and reducing cat inappropriate elimination (PDF). Where would you like your dog to pee and poop outdoors? Decide on the area and have lots of special treats ready to give him every time he goes in his area. In the house, prevent any opportunities for your dog or puppy to have an accident. Keep him with you on a leash or crate him when you can’t supervise. Control his environment. Confine him in a crate or dog proof room. Manage him like this in the house for at least three weeks. Start a routine of visiting an area you do want him to pee and poo in. Visit this area in the morning, after meals, and before bedtime. Go with him to the area. Yes, every time! When he pees or poos in the area say “yes” and reward him with a yummy treat. Reward him every time he goes outside. No accidents for two weeks? Now loosen up your management in the house. If your dog or pup starts to go interrupt him with ‘Uh Uh’ and redirect him to outside. Don’t scare him, just a gentle oops. Don’t forget to reward him for doing his business outside. If your dog has an accident during the three weeks ignore it. Clean it up when he’s in the other room. Remember they don’t pee and poo in the house on purpose. We have to teach them when and where to go and make it worth their while. Do not punish your dog even if it’s only 10 seconds after the accident. This is ineffective and abusive, your dog will learn to be afraid of you and not to pee and poo outside. If your house trained dog starts to have accidents get a veterinarian checkup. Make sure there are no medical concerns. Why does my dog pee on stuff when I leave the house? Dogs communicate with us through their behaviour. Peeing on your stuff may mean your dog is trying to tell you something. Dogs don’t do it because they’re mad! If your dog is house trained and this is a new behaviour, get a vet exam as there may be a medical issue at play. 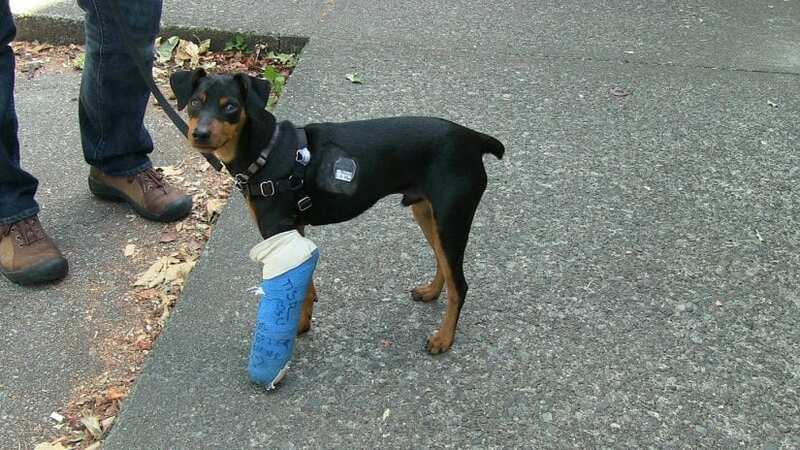 If your dog has always had accidents then it’s best to restart your house training. Learn how to house train your dog. Some dogs will pee on things around your house or outside to communicate, find a partner or to let others know this is their home. If your dog is urine marking, start by house training him again. Always make sure his bladder is empty before you leave him alone. Reward him for going outside. If he’s not neutered, ask your vet about whether this might help. Does your dog have anxiety when you leave? If you think your dog has separation anxiety, see your veterinarian for a diagnosis. See your veterinarian if you suspect your dog is suffering from separation anxiety. ​My cat won’t use the litter box what should I do? Cats learn where to go to the bathroom and how to cover it as kittens. It’s easy to teach cats to use a litter box because they want to be able to bury their waste. If they stop using their box it’s a concern. They don’t stop out of spite or disinterest; there’s always a reason. Have you taken your cat to see a vet? If not, get him checked by a vet, especially if he’s always used his litter box and now he refuses to use it. If so, and if your vet says he’s healthy, ask how you can help your cat or for a referral to a professional. Make sure the cat’s litter box is in a quiet location. Place it in a corner where no one can surprise or scare him and somewhere that isn’t busy. Keep it away from his food. 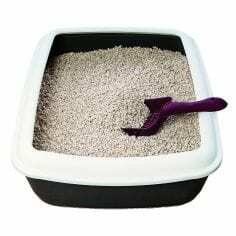 What size is the right size litter box for your cat? Rule of thumb is litter box should be one and a half times longer than your cat. Go bigger if you’re not sure! Think of what your cat needs, not what you prefer. A covered litter box holds the smell in, but this could prevent the cat from using his box. Boxes with high sides might be too difficult for older cats to get into or out of. Self-cleaning boxes might be too scary for some cats. And some cats don’t like plastic liners. A simple box at least four inches deep, the right length for your cat and without a cover is ideal. If you have more than one cat you should have a box for every cat, plus one extra. Try different types of litter to see what your cat likes. Put four litter boxes out with different types of litter and see which one he chooses most often. Try different amounts of litter in the box, as some like deep litter while others might not. Stop using the freshener you’ve been using and when you find a litter he likes, stick with it. For many cats a clean litter box is important. Try scooping it twice a day and cleaning it once a week. Some cats may not use it if there’s anything in it. Remember, you may think your cat is being bad and doing it on purpose. This isn’t true! There is always a reason why your cat is missing the mark. Find out why and help him, never yell or spank your cat. Find more on litter box issues in our fact sheet Litter box problems treating and reducing cat inappropriate elimination (PDF) and in this video on how to get your cat used to their litter box. How do I update my pet’s identification (ID)? Is your pet’s microchip, tattoo or license registered with the BC Pet Registry? Updates can be made at any time. Registered users can also add additional forms of identification (ID) to their pet profile. Call your veterinary clinic so they can update their records. You can also register your pet’s tattoo with the BC Pet Registry. In most municipalities, you must license your dog. Contact your local animal control office (e.g. City of Vancouver Animal Control) to update your phone number, address or family members on file. You can also register your pet’s municipal license with the BC Pet Registry. Will my pet become fat and lazy once he or she is fixed? No. Your pet will actually benefit from spaying or neutering, because he or she will lead a healthier and longer life. Pets become fat and lazy as a result of overeating and a lack of exercise, not from spaying or neutering. Furthermore, spaying a female eliminates the possibility of her developing uterine and/or ovarian cancer and greatly reduces the chance of breast cancer. Neutering a male eliminates the risk of testicular cancer.